When entrepreneur Matt Meeker went shopping for his Great Dane, Hugo, he came away from their local big box pet store less than impressed with the unexciting products. So he decided to start a subscription service for dogs called Bark. But here's the question: when you're selling to furry friends, who is the customer experience aimed at? Humans or dogs? Host Mio Adilman finds out by talking to Bark executives, retail and animal experts, and some pretty crazy dog moms and dads. Hernan Giraldo, Bark's VP of Customer Experience Operations, outlines the company's "direct-to-dog" ethos. Retail expert Phil Chang, AKA Retail Phil, describes the changing relationship between humans and their dogs and how this has revolutionized pet retail. Christy Hoffman, an anthrozoologist at Canisius College, weighs in on whether dogs can be customers at all. Hey! Welcome to Repeat Customer. A business podcast from Zendesk about customer experience. We have lots to talk about, but first I have to tell you a story about a fish taco. Hi, my name is Paige. I don’t even like fish. I don't eat fish tacos, but I love that fish taco. So, that fish taco that non-fish-eating Paige loves, is not a real fish taco. His name is Ernesto. Ernesto is a toy. He looks like a koi fish in a taco shell. It's a plush toy. Are we clear? Ernesto is a plush toy that looks like a fish taco. Casey was an only child when we first got Ernesto. If it’s not in the toy box, he will look around the house until he finds it. But in the same way Ernesto is a toy and not a real fish taco, Casey is Paige’s child but he’s not really an actual child. Here Casey, you can have it. Get your fish taco, bud. Casey is a dog. He's a chocolate Lab/German Shorthaired Pointer. And Ernesto, well, Ernesto came in something called a BarkBox. BarkBox is this subscription that you get a box of toys and treats for your dog every month. BarkBox. A subscription service. For dogs. Much more about BarkBox in a moment. But before that, listen to what Paige did after getting Ernesto. Ernesto the fish taco was such a big part of our family that I went and got it as a tribute tattoo for my dog. It's huge. Oh my goodness, that is Ernesto on your arm. Yes, it looks just like him. Casey the dog’s favorite toy, Ernesto the fish taco, is now a tattoo on Paige’s arm. Ow! Stop biting me. I am not food. And Zendesk is a customer service and engagement platform, and the people there are, you could say, kind of obsessed with what goes into great customer experiences. So they’ve sent me and my husky voice down the path of leashed resistance. A deep rabbit hole. To figure out how Bark, the company behind BarkBox, created a customer experience for dogs. For dogs? Hey there, human. You’ve reached Bark’s Happy Team. For immediate assistance, press one to send us a text. Press two to chat with us on Facebook. Press three to speak to dog (beep) (dog barking). Now that’s customer service! But who exactly is the customer here? Dog or dog owner? That’s gonna be my question for the crazy dog people at Bark, but first let’s get up to speed on what a dog’s life looked like before Bark. At one point, guards were guard dogs. You built them some sort of wooden shack or whatever so they would be able to shelter themselves, and you left them outside. I don’t know a lot about dogs. In fact, as a kid, dogs would see me and start barking which would freak me out, which would freak them out. And then I would run for my life. So, I found this guy, Phil Chang, also known as Retail Phil—that’s the name of his retail consulting business, to help me out. Phil doesn’t fix dogs. He fixes companies. And, he is, among other things, a pet retail expert. Which I find incredible. Even more incredible? He doesn’t have a dog. Anyway, so, I get it. Historically, people kept dogs to do certain jobs. Guard the house, you know, retrieve pheasants while hunting, if that was your thing. Then, after hundreds of years of that, dogs moved from that wooden shack in the backyard to inside your actual house. But this is what it was like when you shopped for your dog. It was very commodity-driven. It was like, here's a dog bed. Here's something from a big brand, pet food, that sort of thing. Just buy it in bulk 20 pounds, 30 pounds...very transactional. Right? You could go into PetSmart, you could go into a little guy, and they pretty much have all the same things. But then something happened that really changed things for dogs. Somewhere in the last 10 years, probably in the last five in particular, dog ownership really started to shoot up. Part of that is millennials; It's a cheaper option than having children, it doesn't interrupt your lifestyle the same way. They started to migrate to this idea that, dogs are children, too. And people started to call themselves dog mommies and dog daddies. As a non-dog person. As a dogless heathen, this is an amazing notion. And by amazing, I mean, kind of crazy. So I run it by Paige. The woman you met at the beginning. The one with the tattoo of Ernesto. So, this is Indi. She is just over a year old. She's a Border Collie-Great Pyrenees mix, and this is Casey. This is my baby boy; he’s three years old. Now, when you say he's your baby, what does that mean exactly? I don't really want kids, so that's my son. And so, do you consider yourself a dog mommy? Oh, yeah, I'm definitely a dog mom. That's me all the way...(bark) Casey! And now dog mommy can’t just let dog baby sleep in a dog bed. The dogs sleep in the bed. Casey sleeps right between us. I know, but babies eventually move into their own bed. Yeah, but he's always gonna be my baby. These couples that don't have children, they can afford more. They've got more time on their hands. And the evolution is in full bloom now. It’s following the kid path. They want really great food. You've got raw diets, you've got grain-free diets, you've got supplements now for dogs…I think dogs wear better apparel than we do now. They have footwear. Sorry, this is still a bit much for me to wrap my head around. But safe to say this was the dawn of the era of the fur baby. Larger pet stores, even local mom ‘n’ pop stores, started catering to dog mommies and daddies. But the dog category was exploding. And the time was ripe for a new customer experience. Enter Hugo, the Great Dane. He’s the dog who changed everything. Hugo belongs to Matt Meeker, Bark’s CEO. And as you probably know, Great Danes are enormous dogs. Hi, my name is Hernan Giraldo, I'm the VP of Customer Experience Operations here at Bark. So Matt...he was on this endless search to find the right product for his dog. He wasn't able to find it as easily as he would hope. You go into a pet store, and the store associate, let's call them, not being able to relate to you as a dog parent because maybe they're more cat people. Maybe they're just really into fish. From that standpoint, there was first and foremost I think an emotional disconnect. Secondly, there wasn't really a whole slew of interesting product. You know, I've heard where he would go to a pet store in his neighborhood, and they would just give him a Benebone. Nothing fun about that, right? There's nothing that you can say, wow, I can really enjoy that experience with my dog. Matt was going to stores looking for three things. One, products specifically tailored to the fairly unique needs of a Great Dane. Two, an experience he could enjoy with his dog. And three, amazingly, an emotional connection with the people in the store. Remember those three things for later. Because, unable to find any of them in a traditional store, Matt Meeker, who was already an accomplished entrepreneur, started BarkBox. BarkBox is a monthly subscription service for your dog. In each box, you get two toys, two treats, and a chew, and everything is usually themed. Themes like Chewrassic Bark, The Good The Bad and the Pugly—how about Knights of the Hound Table. These days, you can pretty much get a monthly subscription box for just about anything, but when Bark launched in 2011, there were very few. The main one was Birchbox, a box of beauty products. Why does my dog need two different toys every month? Why do they need that much stuff? Yeah. You know, Mio, you asking that question tells me you're probably not a dog parent. And that's okay. That's okay. But crazy dog people, they will go to bars specifically because their dog is allowed. I think in that spirit, we want to spoil our dog. We're making that experience through the subscription business really, really easy for you, and effortless, right? You don't have to do anything. All you do is have an unboxing with your dog, and you're sharing that experience, and you're seeing how excited your dog becomes when boxes start to arrive in general, because they think they're all BarkBoxes. So I've arrived at my friend Michael's apartment. Michael has two dogs, and I've come with these BarkBoxes. They've never tried them before, and my understanding is that one of Michael's dogs is a puppy...and very excitable. I've been warned the dog is a jumper. Hi, how are you? Hey, hey, hey. Chudleigh just jumped right on top of me. That's Chudleigh licking the mic. I’m definitely out of my comfort zone. Michael’s dog Chudleigh is seriously invading my personal space. So I pull out the BarkBox. This month’s theme is Egyptian. Age of the Fur-oah. Get it? Pharoah...Fur-oah? Chudleigh rips the Fur-oah out of Mikael’s hands and runs around the apartment. Wagging her tail. Chewing on the squeaker. And then Michael opens the other toy. It's a slug bug beetle tug. I'm laughing because I don't know. There's an Egyptian scarab thing like, I look like an idiot but the name of this toy is hysterical. At this point, I’m not even sure who’s having more fun. But I guess that’s the point. Judging by my visit to Michael’s and also the countless unboxing videos I’ve seen on YouTube, dogs and their humans are getting that shared experience that Bark CEO Matt Meeker envisioned for himself and Hugo, the Great Dane. But this begs the question I’ve been waiting to ask. Who's your customer, though? Dog, or human? Yeah. No, that's a great question. To us, our dogs are the customer. The human or the dog parent is there to...facilitate that transaction. But how can dogs be customers? They are dogs! You know, I started this podcast, knowing very little about what actually goes into customer experience. I’ve done my research, talked to some bright minds in the CX space, learned a lot about how customers think, feel and act. And when I say customers, I mean humans. Now Hernan wants me to believe that dogs can also be customers. So, in an effort to remain open-minded, I find someone who has peered deeply into the minds of dogs. Hi, my name is Christy Hoffman. I'm an assistant professor of Animal Behavior, Ecology, and Conservation, and I also run the Masters program we have here at Canisius College in anthrozoology, which is the study of human-animal relationships. Most dogs don't have a lot of freedom to make decisions, but what we found is when they do have that freedom, they are pretty impressive. When I ask you if dogs are like humans, I understand that they are animals. But you think that there is enough there in a dog that they have some sort of...autonomy over their thoughts and feelings. Definitely, definitely. If you want an individual that doesn't have any sort of thoughts and feelings then a stuffed dog might be a good option. But certainly dogs do have thoughts, and feelings, and opinions. But their preferences for things may be a little different than what we might anticipate. So for humans, obviously, vision is very important to us, and hearing, but our noses don't work very well, for example, compared to dogs' noses. We might be attracted to the color of a toy or the material that its made of and for our dog that might be the case, but also it may be that the smell is offensive...like, with a dog "Ew, I don't like the smell of this rubber toy." So, broadly speaking, dogs are capable of being customers. Yes. I think we have to step aside and watch our dogs and how they engage with those products to really understand what they really want out of toys, and treats, and various things they can chew on. OK, my mind is completely blown. Dogs can apparently be customers. And their individual preferences should be studied by pet retailers and pet owners. I mean pet parents. And this is exactly what Bark has done, according to my main man Retail Phil. So they literally said, "Listen, tell me about you and your dog. Tell me what you love about your dog. Tell me all the things that excite your dog, and I'm going to deliver you every month something super cool that surprises and delights you. And even more so, your dog's going to freak out when that box comes in." And you think, "Oh my God, there's somebody in that office who understands what my household looks like and what I want." Phil is describing personalization. But for dogs! Personalization? It should be canine-alization? Or animalization? One of the really interesting things that I saw on the Bark website was this breakdown of different so-called personality types of dogs. (sigh) I see a dog, I see a dog. I see two dogs, I see two dogs. I don't see different characteristics. I mean, I know that dogs served different functions 200 years ago. They've really gone for that, and it really seems to have hit with the customer. They've turned science into something where there wasn't any data before. They have data. I don't know if it's enough of it's a true computer algorithm, but it's certainly a human algorithm...and they're tapping into that of like, "Listen, your dog's a terrier, he's got to go chase things, right?" Like, "Your dog's a Border Collie, it needs to gather things or herd things. How do we give them toys that are going to do that?" But those are the things that pet parents are looking for, right? It's just like your kid; at four your kid's trying to do something different. At six, you know, at 16, your kid's trying to take your car. Like all those sort of things, right? And so, it's the same sort of mentality they're after. And we’re back to the dogs as children thing. Hernan at Bark breaks it down for me further. How can we appeal to your dog’s unique play style? We do obsess about, kind of, the details. How does a dog play with a crinkly material, or how does a dog react to fabric that resembles feathers? There's this squeaker board in New York City that our designers and merchants look at. There's like 50 different types of squeakers there. Welcome to BarkShop. My name is Lori. So we have the super squeaker. And the classic squeaker. Much quieter, much higher pitch. I find that this squeaker is a lot more gentle on my human ears. It’s a tube squeaker. Finally, we have Verne. Verne the Vulture. Verne, really good for shredding. Is that possible that there are that many kinds of dog personalities that would inform those level of choices? Yeah. Just from personal experience, I'm going to tie it back to my own dog, Chili. She loves cuddling with toys. While there's a ton of dogs in our office that we know, that they're, for lack of a better word, they're destroyers...There are dogs that just want to take out the fluff out of a plush toy, while there's others that we're calling squeaker seekers, right? That they won't rest until they get to the squeaker. And it's hilarious how that varies from dog to dog. So by using data, Bark has created a way to personalize the products, and give your dog something unique. Another wish on Great Dane Hugo’s list checked off. Add it to the wish for shared experiences. But now we come to probably the most sort of, in my mind, “out there” wish. That’s to have an emotional connection as part of the retail experience. Have you ever even thought about that as an option before? From what I can tell, the engine of Bark’s operation is customer support. They are called The Happy Team. And they all have one very important thing in common with their customers. Part of our secret recipe has been, we don't compromise on hiring dog people. We’re a company of dog parents. We can relate at every level of emotion at what you, as a dog parent, experience. So it might not be a surprise that Happy Team members bring their dogs to work. [Hernan Giraldo]It’s a chill day. Typically it’s a little louder but that varies if the dogs are off-leash or not. But it’s very common that you’re working throughout your day you’re hearing a squeaker or two (squeak) so it’s very common you’ll hear that in your day or if you’re in a meeting. They're all in, like they literally make no bones about being dog people, and they could give a crap whether you believe that they're being hokey or not. Their dogs are everything to them. And you’re not legitimate if you aren’t thinking of it through a dog’s eyes. We see ourselves much more than a customer support team because we're hoping to deliver an experience through personal connections with customers. The way we accomplish that is obviously in different forms with a very unique, and kind of an informal tone, if you will. It's pretty common that when you interact with us, we'll use a dog pun or two, or use a funny dog GIF. Another exciting thing that we're working on is trying to engage with our customers through video chat. Imagine an experience where you can connect with a fellow dog parent and kind of you're both showing off your dogs through that interaction. That idea came up because oftentimes when customers would call us, they would hear our dogs barking in the background. They'd ask about that. Quickly, that conversation evolved to, tell me about your dog. Before you know it, we had team members kind of FaceTime-ing and showing our dog parents, kind of, our office. My name’s Kirsten. This is my dog Jackson. He’s a Golden Retriever. Anything that’s squeaky and super obnoxious he loves. He likes to play tug (laughs). They become pen pals, and all they do is just talk about their dog. Right? They start following each other’s dogs on Instagram, which is really cool, to see how from an interaction where customer is just wondering where their package is to, uh, pen pals, it's a really cool experience to see. Customer support becomes something way deeper. An emotional connection based on a shared love for their dogs. And a community is created. And that connection leads to a way deeper level of support. All dog parents that cancel their subscription because their poor dog passed, all of those customers are getting a handwritten condolence card. Because we do believe that even though, potentially, our business relationship has ended with that subscription, we know what a tough loss that is. Those condolence cards often include an artist drawn image of the dog. If you don’t believe me, check Twitter. There's countless examples where we've heard of dog parents having a little bit of financial hardship, or a major life change, and we will take it upon ourselves to give them a month or two of free BarkBox, just so that their dog doesn't have to suffer in a moment of hardship. And there’s another thing I’ve heard that Hernan’s team does that takes everything another step way further. We essentially identify customers who have moved cities, and all those customers, we actually take an opportunity to research the most highly rated dog parks or vets, or dog-friendly bars. We understand as dog parents how stressful a move can be for a human and their dog. Just like dogs, The Happy Team becomes best friends with the humans they’re supporting. And this sense of community isn’t just for the tough times. Here are just a few of the belly blasting, muscle molding, chins chiselling exercises you can expect to master with “pug trainer.” Pug squats. Pug lunges. Pug plank. Pug crunches. Pug curls, and, everyone’s favorite, Hot Pugtato. And so many more. Bark throws a bunch of groan-worthy content up online that only a dog lover would appreciate. And they promote yours too. As we think about our social platforms, or our social presence, it's been a really, really great way for us to introduce ourselves to other dog parents. It can be a funny meme of a dog video...It's also giving them a safe place to be themselves, and be crazy dog people, and share photos of their dogs, and share that experience with other dog parents. So, we do have celebri-dogs, that help us kind of promote our voice. There's like 500 of these celebri-dogs that are putting out content, and appealing to our customers...people that are super excited about their dog. Celebri-dogs. Dog influencers. Sponsored by Bark. The same way a fashion or cosmetics company will sponsor someone with a big Instagram following. Except in this case, the influencer is named: Chloe Kardoggian. People know you by your dog, right? So, when you're around pet people, they understand. Like if you got a Schnauzer, they're like, "Oh, Schnauzer person," right? Like, "I'm a Jack Russell ... " It's just the weirdest thing, but there is that sense of camaraderie, and the Bark guys, they wear it, they know it. Then that makes people go, "Listen, like these guys are insanely serious about pets and dogs. How can I not trust them?" So Bark has delivered on the dreams of Hugo the Great Dane. A personalized experience shared by dog and dog parent as part of a larger emotional connection with dog retailer. 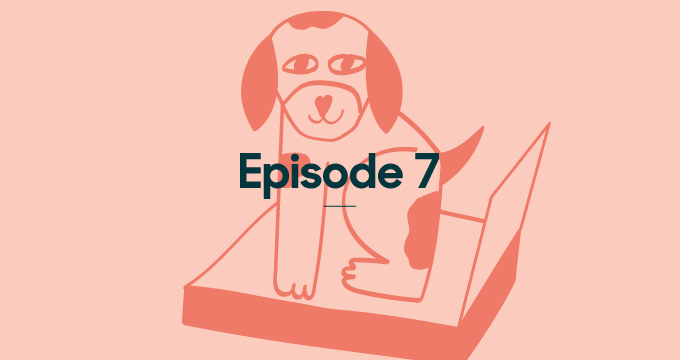 And surprisingly, despite the disruptive customer experience Bark has brought to the pet industry—I mean there’s a lot of dog subscription services now—their growth doesn’t seem to have been challenged by the larger chains, and mom ‘n’ pop stores. No one I spoke to described any controversies or major tensions. With all this growth and then with all this proliferation of products and the way that pet owners have gone out on this one or pet parents, the industry doesn't have a clear dominant player. The pet industry is a 500-million-dollar business, growing, I think, somewhere in the 5% to 10% range year over year. And Bark has gone beyond subscription to now include Barkshop, an online store, and Bark products are also now available in Target. But with a growing number of people who consider themselves pet parents, what’s next? Is this just for dogs? No. No. The madness is just beginning, so it is about dogs right now. Cats will be the next thing and then small reptiles all of those small animals will come after that. Actually if you want to know where dog was 10 years ago, go look at all the cat products out there, that's what it is right now and so you're going to see that cat industry come up right behind the dog industry. But you can't call it a cat box. I don't know...yeah, maybe not. Nobody's going to buy a cat box. Kitty litter. OK, you’ve been listening to Repeat Customer by Zendesk. A show about how customer-focused companies create great customer experiences.